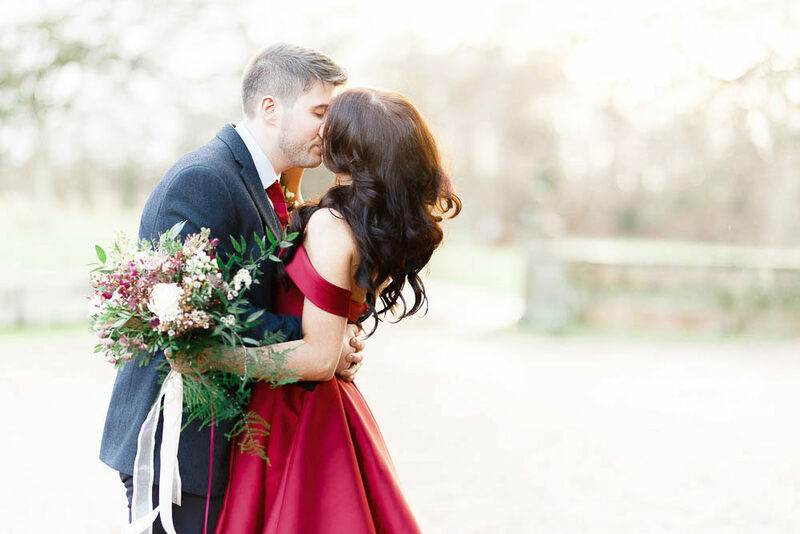 I can’t think of a better way to start the New Year than marrying your best friend and having a magical Winter wedding with all your favourite people at the oh so elegant wedding venue Iscoyd Park in Shropshire. 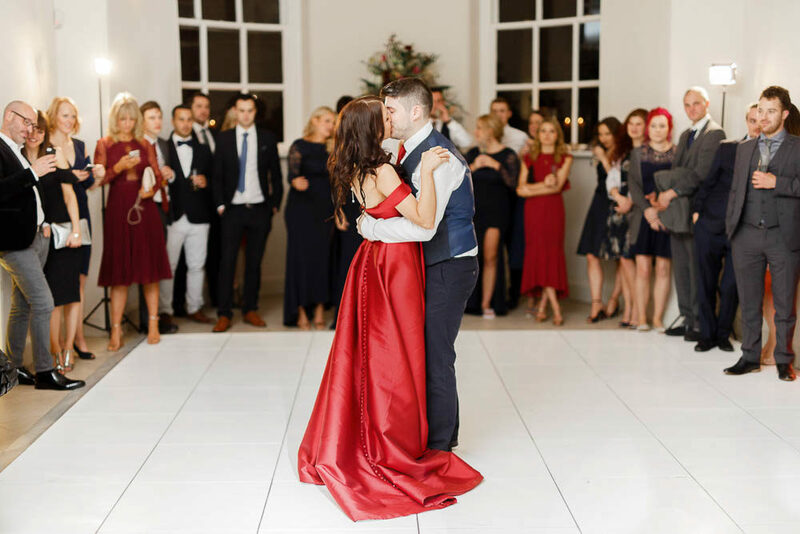 And to top it all off Bride Laura wore the most sumptuous bespoke red gown designed by Agape Bridal Boutique, which just popped against all the crisp white decor at Iscoyd. The rest of the bridal party wore Navy woollen suits from Slaters and lace gowns from ASOS, and together they looked picture perfect. Adding to the ambience was lots of candle and fairy lights, as well as the golden glows of dusk as the sun went down, making for some truly breathtaking portraits captured by White Stage Wedding Photography of our gorgeous couple. Laura the Bride: I wasn’t the girl who had always planned her wedding so when we got engaged I was starting from scratch! All I had known was that I wanted to get married abroad but for family and travel reasons, that wasn’t an option. 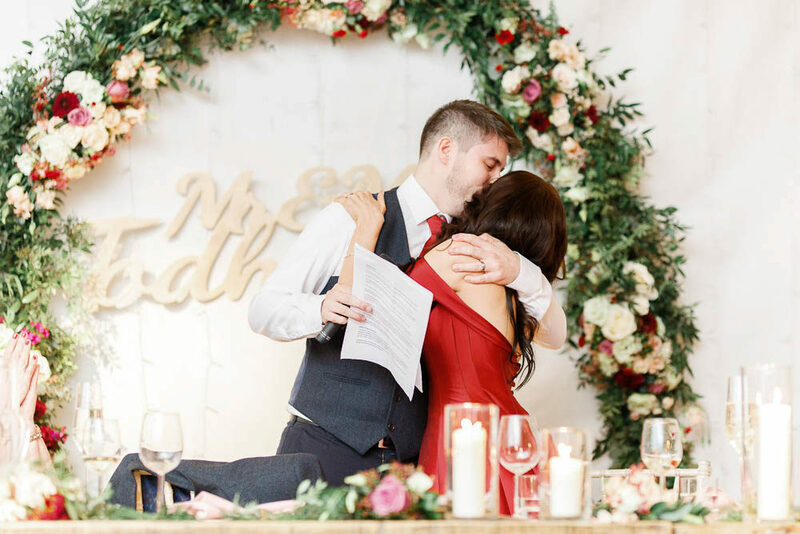 I therefore had a big adjustment to make in trying to create my ideal wedding here in the UK and this resulted in us viewing around 30 venues, at all ends of the country! 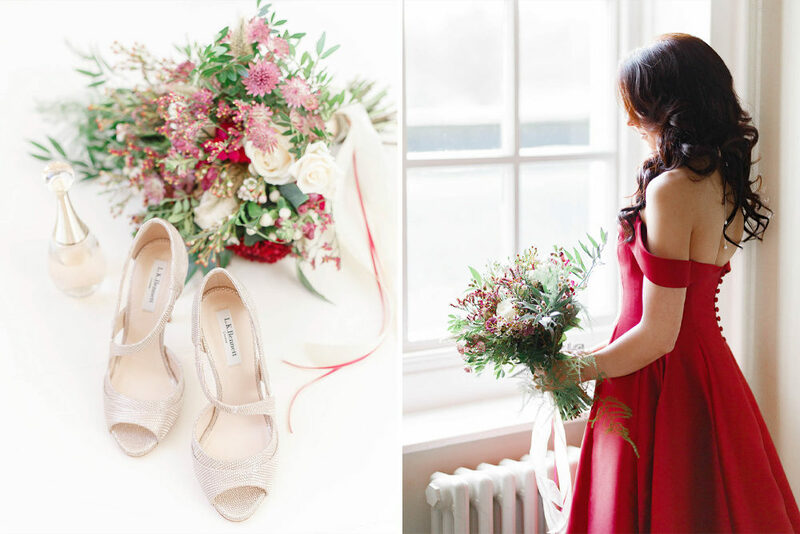 Having had my heart set on an abroad wedding in the past, I didn’t want to risk failing to recreate that in the unpredictable UK summer so we decided to go for the opposite and have a cosy winter wedding instead. 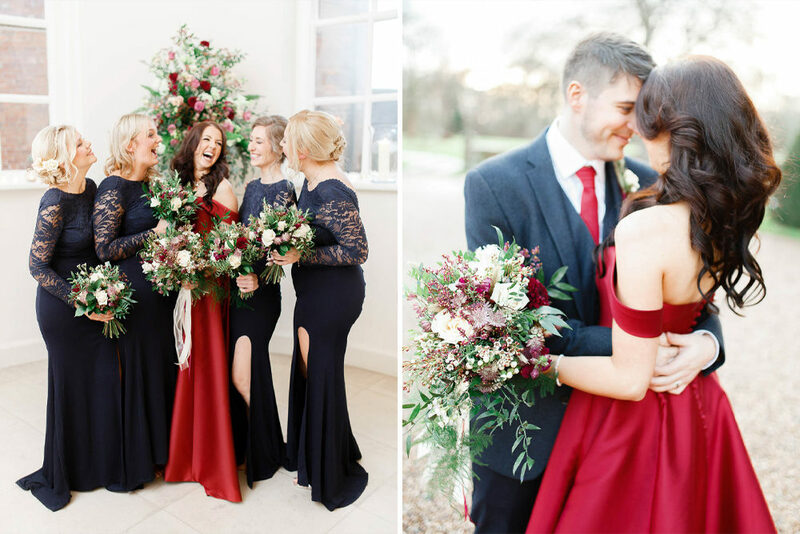 Having decided on Winter, we felt Christmas would be a lovely time to get married; to play on the festive spirit and really capitalise on the wintery theme. Not wanting to catch people amid Christmas shopping and work parties, we decided to go for the period after Christmas and because we love a good party, we thought New Year’s Eve would be a really special date, with everyone in the party spirit. We were surprised how many people were actually grateful to have NYE plans organised for them! I found venue hunting really stressful as I couldn’t find anything that really ticked all the boxes and I am a known perfectionist so this wasn’t sitting well! 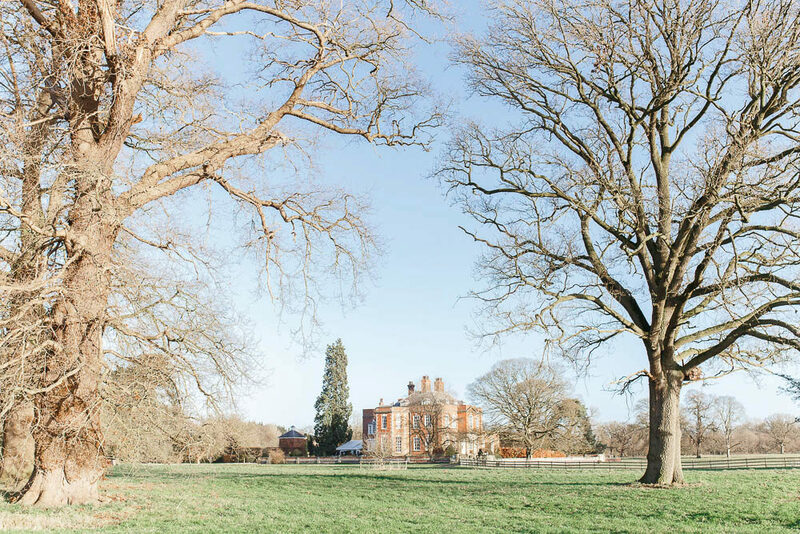 I remember scouring the internet for probably the 100th time when I found Iscoyd Park….I watched the video on their website and got butterflies….quickly followed by a sinking feeling that this place was definitely going to be too expensive for us! Having been to look around, it was just the perfect venue for a winter wedding with its open fires, candles and gorgeous bedrooms, It also had the amount of accommodation I had been looking for so that the bridal party, groomsmen and close family could feel like they were at a big house party and not have to worry about taxis home. It was the most beautiful place to have our wedding and the thing that strikes you from the moment you walk in is that the staff are like no other staff at any other venue! They were truly the loveliest, most helpful people I came across and I knew immediately they would make sure my day was perfect and nothing was too much trouble. 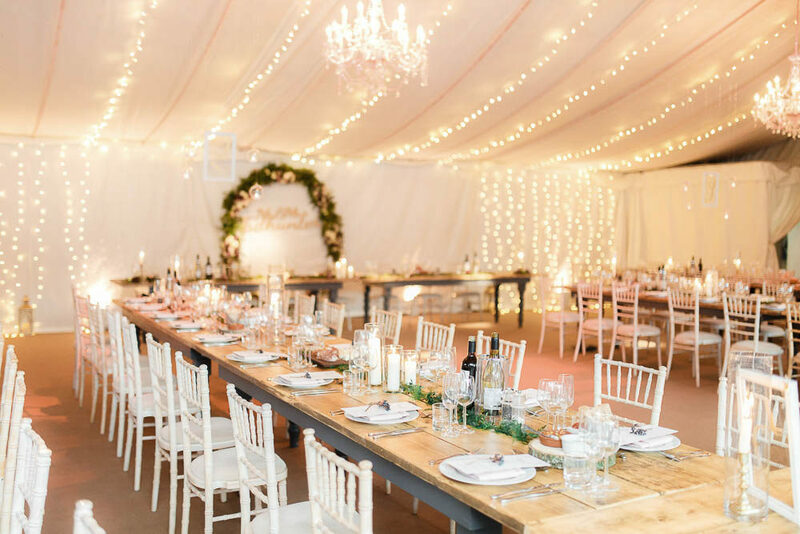 Once the venue was booked, décor was next on the list because Iscoyd is a lovely blank canvas that you can do a lot with. 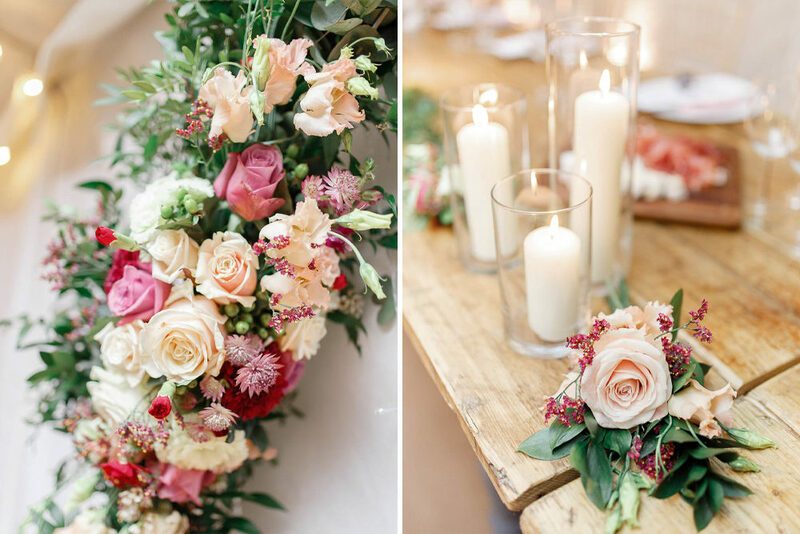 I wanted an elegant, ethereal, wintery feel and knew that the flowers would include wild flowers, berries and deep reds/plums. When I came across Campbell’s Flowers online, I could tell that their style was exactly to my taste and when I met with Tracy she just seemed to understand what I wanted without me having to say it! I had a slight bump in the road in that I had booked a wedding planner but we just weren’t seeing eye to eye and ultimately parted ways…only a few months before the wedding. This was quite stressful as I had paid her money and was worried I would now be the one running round setting up the whole thing on the morning of the wedding! 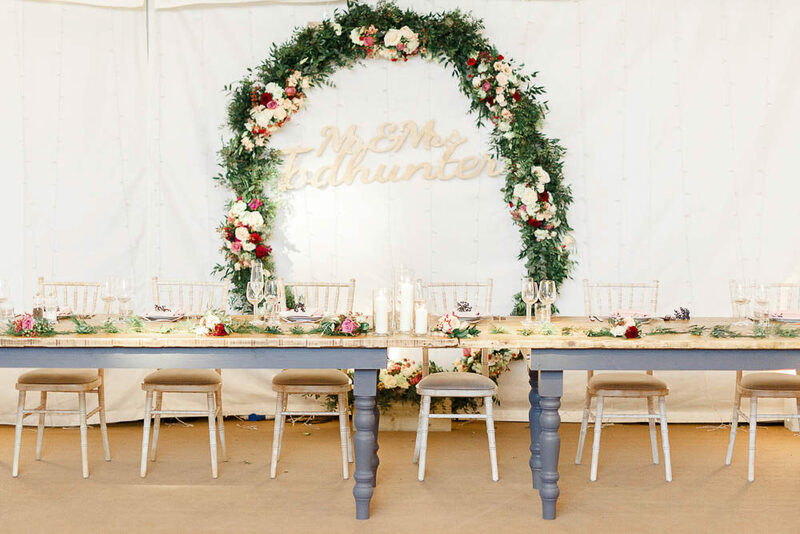 At this point I went into DIY mode…I started sourcing and making the touches I wanted that we were struggling to find and then desperately tried to find someone who could dress the marquee for me on the day of the wedding. I created my hanging table numbers and welcome sign by getting framed glass bespoke made, buying bespoke stencils and painting the gold lettering at home. They turned out better than I could have imagined! My mum came across a lady called Tam at Tamaryn Treasures and because I was so busy with work and other planning, went to see her for me to see if she would dress the venue for me on the day. She couldn’t speak more highly of her when she got back and once I met her for myself, I could see why. Tam is extremely well priced for someone who delivers a first class service; nothing at all was too much trouble, she wanted to help in any way she could and on the day she made the place look BEAUTIFUL! 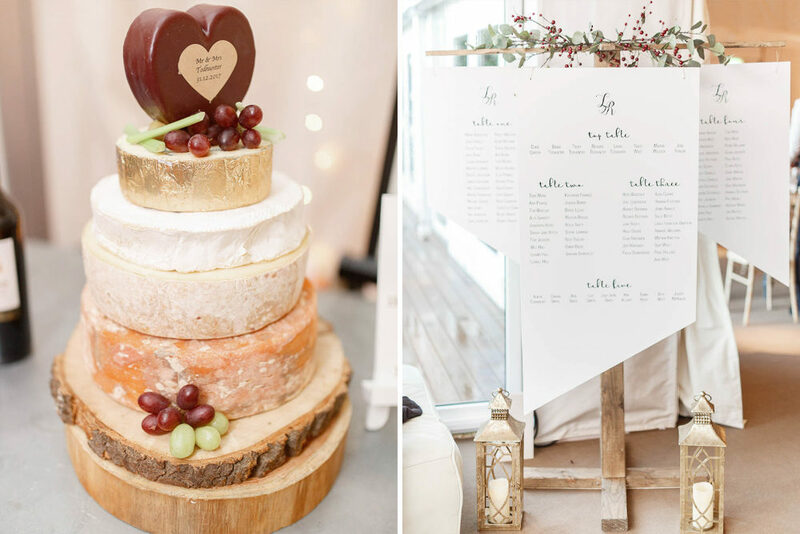 I also had my heart set on a freestanding table plan and so had a chat with our lovely family friend George Whittle, who is very handy and asked if he could make the stand for it. He finished this for me a couple of days before the wedding! When it came to printing the ‘flags’ for the table plan, I had previously been in touch with a supplier who let me down at the last minute. When I was younger I worked for a company in my home town called Prontaprint and am still in touch with Alex and Kim there, who I count as friends. I got in touch with them about a week before Christmas and asked if they could create the flags I wanted. They did everything so perfectly and so quickly and they too were then delivered a couple of days before the wedding…at this point I felt it was all coming together and was so grateful for the help I had been given in helping me create exactly what I wanted. When choosing the photographer, I again spent a lot of time scouring the internet and looking through portfolios. Ultimately White Stag were brought to my attention as a referral from another photographer who I had found who offered the light, airy fine art photography I wanted. As they are based down south, we had an initial Skype call and agreed almost immediately after that they would be our photographers. Their style was exactly what I wanted, you got two people for the price of one (!) and you couldn’t meet two more lovely, genuine, helpful and friendly people. We are both so pleased with what they captured on the day and many of my friends and family have commented on how lovely Andy and Catherine were to chat to. The debate as to whether we wanted a videographer went on for some months; Rich didn’t want to spend the extra money but I had been told more and more by people who had got married that this was a must have memory of the day. I started looking around and came across videographers that offered a more ‘cinematic’ style film and absolutely loved it; it makes your whole day look like a movie! I liked that Bruce didn’t let you pick your own music, as he knew exactly how to create a mood and a beautiful piece of work through both image and sound. The final edit is AMAZING and half of my Facebook friends seem to have been brought to tears by it!! My dress was probably one of the most distinctive parts of our day…and it was the result of an extreeeemely long journey! I didn’t go into dress shopping specifically looking for a coloured dress…I started in all the traditional boutiques looking at many of the classic designers. This went on for some time and I think I must have looked in about 50 shops….from Manchester to London to Warwickshire and Cheshire! It lost its excitement in the end and I desperately just wanted to find a dress I felt like me in… but I was just not feeling special in anything I tried. After trying every style you could think of, I finally reached the conclusion that I was struggling because of colour; in my daily life you will never see me in white! I wear black and grey most of the time or will go for a bold colour such as red or blue. I am quite pale with dark hair and I just feel less comfortable in pale colours. So I started looking at dresses with a bit of colour….quite hard to find and limited in stock! I ultimately committed to a Temperley dress and it was a huge relief to have found something ……but the more and more I tried it on the less and less I felt right in it and every time I looked at the pictures of the fitting afterwards I felt less sure about my decision. I think my mum could tell and so she told me we were going shopping again to try and find something I loved. So we started over….and ended up in the same place with no real contenders. 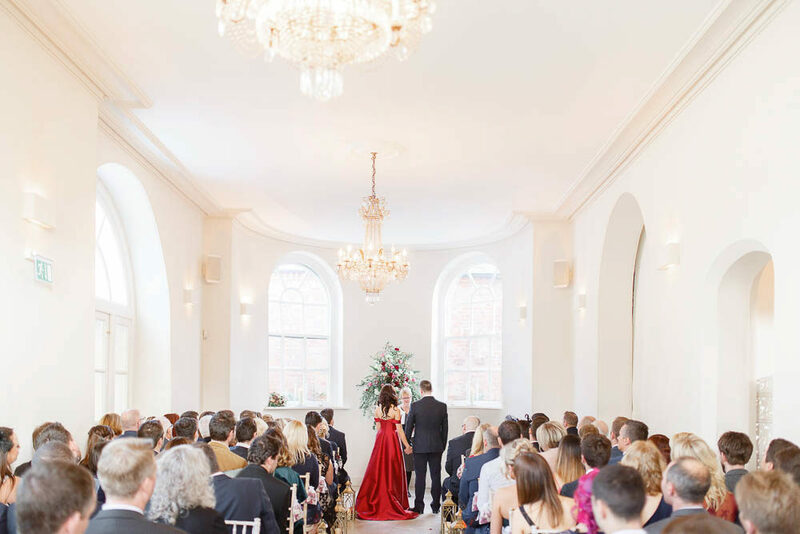 Having paid a deposit on the Temperley dress, I decided I needed to speak to the Bridal Boutique and see what we could do to sort the situation. Considering I was messing her around somewhat, Karen was unbelievably understanding and so lovely to me…she said that she wanted me to feel perfect in my wedding dress and that’s when she offered to make me a new dress for same price as the remainder due on the Temperley dress. At first I wouldn’t have considered a bespoke dress as I really didn’t know what I wanted but by this point I had tried on so many that I knew the basic style I wanted and we started the process! We started off with the idea of an ivory dress with red embroidery but once we got part way through that design, we all felt it wasn’t working (yes, I was the nightmare client!!). So Karen started again from scratch but this time I decided I needed to stop worrying what everyone thought and go for what I wanted, which was a full red dress. As soon as we stated choosing colours and putting them against my skin, I immediately felt more comfortable. Ultimately Karen had about a month to create my dress and I couldn’t have been happier (and more amazed) at what she did in such a short period of time. It was gorgeous and whilst I was still worried what people would think, I felt so much happier when I put this dress on; I knew it was right. I did have to have the chat with Rich before the wedding though, as he is a very traditional guy and I knew the shock of a red dress would have thrown him on the day! So I told him the colour and after a small period of adjustment, he got excited about it along with me. He still had no idea what the style was like and you can see on the pictures and video it was still a shock for him when I came down the aisle. To add to the ‘house party’ feel, we went for a sharing menu too; by NYE we felt everyone would have had enough roast dinners! We had sharing boards to start with meats, cheeses, breads and veg and then a huge cottage pie for main. Dessert was a bit of a showpiece, as we had big Lemon Meringue Pies that were torched at the table! Fine Dining did an amazing job on all the food and lots of people have commented on it since. We also went for Cheese and Pork Pie cakes for afterwards as we are more savoury lovers than sweet! The only other real difference on our day was a poem that I read to Rich as part of our vows. I had originally planned on giving this to him on the morning of the wedding but decided that if I could hold it together, I would read it to him in the ceremony instead! I am so glad I did this; I think it brought a bit of humour and personalisation to the ceremony and people have since commented that it felt like a really intimate and different ceremony which is lovely. Beautiful venue, looking forward to shooting here soon!